Rio Grande Fence Co. of Nashville has been counted on time and time again to install quality fence solutions for the most demanding government agency facilities in the Mid-South, including Fort Knox in Kentucky. Government agency fence consists of tall (10’, 12’ and up) galvanized chain link fence with barbed wire systems for exterior perimeter security. 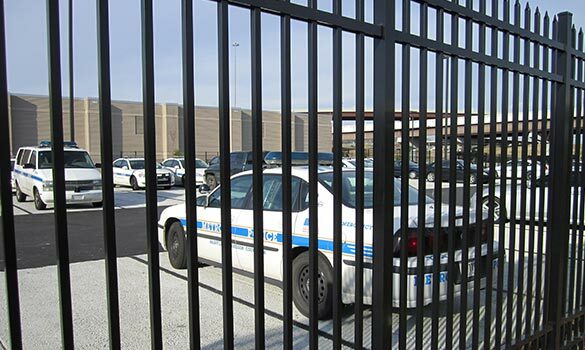 FBI, TBI and Tennessee Emergency Management Agency facilities have deployed steel ornamental fence solutions from Ameristar Perimeter Security. Ameristar's heavy steel ornamental fences and cable barrier systems are designed for force protection around bases, as well as physical security of the assets within military installations and federal facilities. Whether to delay individual attackers or stop vehicular attacks cold, Ameristar makes the product you need. For industrial and high security projects, Montage II is the preferred choice among fence specifiers. The Montage II ornamental steel fence panel is made up of heavy 1” x 14ga. pickets & 1 ¾” x 12ga. rails that are welded using state-of-the-art fusion technology. Montage II industrial fencing has an E-coat maintenance-free finish, recycled pre-galvanized steel and a 20-year warranty. Higher security level fencing has been redefined with the unique profiles of the Impasse II security fence system. Its steel cross sections and intimidating profile make this security fence a strong deterrent to intrusion. The multiple styles and rail configurations of the Impasse II high security fence give this palisade system the best delay time when compared to other perimeter security fence products. To provide your government agency with perimeter security and peace of mind, contact the commercial fence professionals at Rio Grande Fence Co. of Nashville today at (615) 244-4766.